Since Zach & I got back from Michigan I've been dying to take pictures of my fave finds yet! Unfortunately with my 9-5 office job moving offices, I've been so tired every night this week to even think about photographs! I am so glad I found a man that love thrifting & antiquing. The only problem? Zach likes 20's-40's and I like 50's-70's. In order to see what our future house may look like, we often go through furniture aisles while antiquing (& in general) and ask each other what we like. When we find something we agree on, we make a note because 9 out of 10 times we won't agree! I've found myself taking pictures of things in stores that I like that I think he may like....so far no luck! 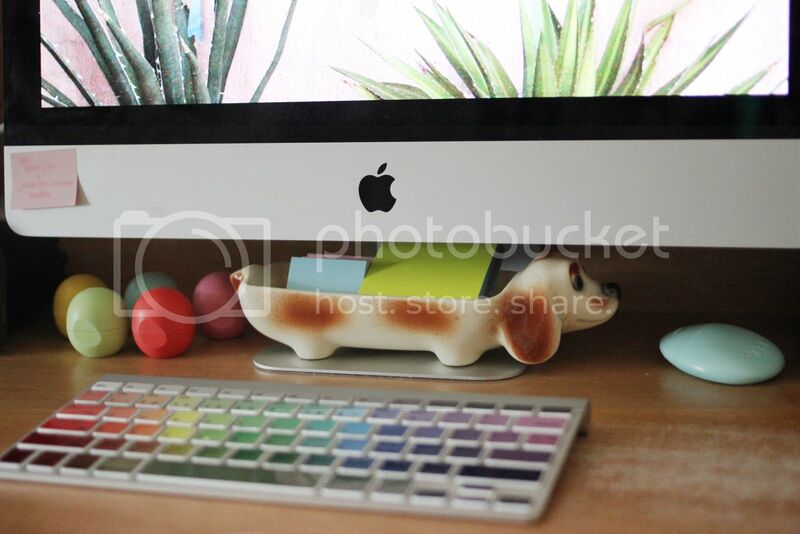 This cute little doggy holder thing that miss Kaylah found at an Estate Sale! I need one of these for my office! Gah, I can not stand the cuteness. Peep the whole post to find the rest of the awesomeness! I'd like to know what states in the US have a state inspection required each year. Virginia is the only one I've heard of! Oh that little doggie holder is so cute! And I'm loving the diy bag...I definitely have some bags that could do with adding some pizzaz! Ugh, I hate getting ripped off by car people, never fun to spend that much money for things you don't think are even wrong. That rainbow keyboard is amazing! Happy Friday! wtf rainbow keyboard!! i'm stealing that. be over in a sec. kbye. Those salt and pepper pots are the best that I have ever seen!